Today I sat in on a workshop given by Nancy Selvin at Heath Ceramics. I've had the privilege on a number of occasions to hear Nancy speak...I think the first time was back in 1991 when I was an art student at the California College of Arts (and Crafts). But that was not the first time I had set my eyes on her work. No, it was a handful of years before, I think in 1987, when I took my first ceramics course I happened upon a postcard with an image of one of her pieces. It had her trademark delicate markings, loose but with intent. It was obvious to me even then, when I was a complete novice, that this was a person who had a mastery of a medium I did not know much about. I was impressed and inspired by what I saw. I wanted to make work like that. It was a remote dream, it seemed impossible to me, especially when I was churning out heavy bottomed, gloppy glazed ash trays from my pottery class. Early this morning as I drove towards Sausalito across the Golden Gate Bridge, with its familiar cloak of fog wrapped around its towers, , I began to think about my own journey as a ceramist. It hit me what a great influence Nancy has been on me. I never had thought about it in concrete terms like that before. 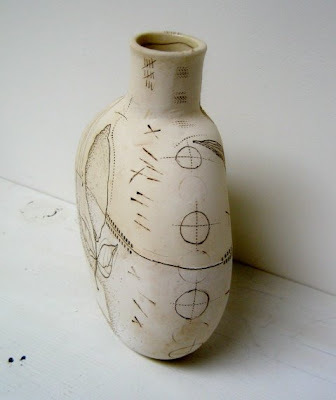 I also realized just how far I had come in my own journey as a ceramic artist. From that very first class i took, fantasizing that maybe, just maybe, someday I would make beautiful work like Nancy. Well not like Nancy, like my own but you know what I mean. I realized that I now give workshops like Nancy at wonderful places like Heath. And then with a little more thought it occurred to me... I have done it! Of course I still have long way to go, and so much to learn, we are really never there, but I have found my own place with this crazy medium. Best of all I am still in love with it. During the class I decided to tell Nancy the influence she has had on me and to thank her for her dedication to what she does. Seeing women like her, committed to doing what they love and doing it well is really the best kind of example anyone can give. Nancy asked us to introduce ourselves at the beginning of the class. You know the usual, your name and what you do. Hi, my name is Diana Fayt and I am a full time Ceramic Artist. 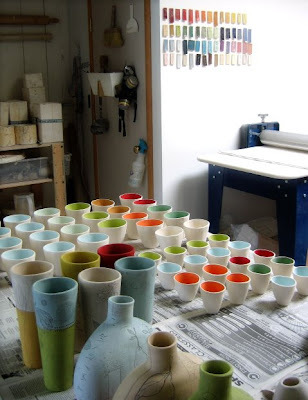 you were wondering where I have gone, really not far, just holed up in my studio making cups and vases and bowls and then more cups, vases and bowls. I am in full on production mode from now until December. It's been nine hour days, filled with casting, forming, drawing, painting, glazing. My knuckles ache and at the moment my back is not being terribly cooperative . I am trying to keep paced and focused so if my posts are spotty it's only because I am too pooped at the end of the day to type. Though I will try and do my best to keep you all posted as things progress. Oh and one exciting bit of news...some the pieces in this photo will soon be going off to Heath Ceramics for sale in their shop. I couldn't be more thrilled 'cause you all know how much I love Heath.